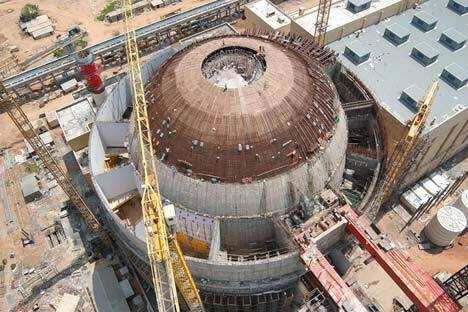 India has started the final stage of tests at Kudankulam NPP designed in Russia. In the middle of March 2011 India has started the main stage of equipment tests at the first nuclear power unit of Kudankulam NPP under construction in the country’s south, The Hindu reported. Kudankulam NPP is the first nuclear power plant, which is built with the Russian equipment by the Nuclear Power Corp of India Ltd. (NPCIL). Its phase one includes two power units with VVER-1000 reactors. NPCIL Chairman and Managing Director Shreyans Kumar Jain said the “hot runs” are the last stage before loading fuel in the reactor. According to the technology, the hot runs that take about one month are followed by looping that also takes about a month. Only after the reactor first criticality is possible. In December 2010 key hydraulic tests were carried out at the power unit. All separate systems have passed acceptance procedures. Some systems have been accepted as assembled after the cold runs. In spite of the fact that a VVER-1000 is installed in India for the first time no problems took place during acceptance procedures of separate systems, the newspaper quotes Jain as saying. The agreement to build the Kudankulam nuclear power plant was signed by the USSR and India in November 1988. Ten years after, in June 1998 a supplemental to it was signed. Russia provided India a preference loan to build the facility. In 2002 construction of the first two units started under Atomstroyexport JSC management. India and Russia have agreed to build at least four more units on this site.